A person under threat for beliefs they hold dear. Threatened because of who they are. A need for sanctuary, a need for space to regroup, reconsider and transform. The need for a watchful eye to protect them in their journey. Emerald is that watchful eye, it is that place of sanctuary from where they have been or where they may have to go. This could be a woman living in a violent or stifling relationship, or just the wrong partner and duty or social pressures trap them. Emerald gives that space in which true choice can be made. An Emerald was placed around the waist of a pregnant women in ancient Egypt to facilitate an easy birth. Negatively the person may be envious of others who have made changes or done better and fails to see that the person has probably done the work to reconcile past traumas. Resentment and bitterness from events deep in the past, unable to forgive. Emerald is the primeval urge to express, be creative and to transform. Green is colour of growth and the Emerald was the stone of Isis. So this is often a spiritual transition, and can be a route to acceptance and servitude more than an escape to try again (and fail again). Equally after a time of sanctuary the person, more strengthened, may break free of the influence of past traumas by taking themselves away from the situation permanently. In a student group proving there were references to conquistadors, being trapped by these soldiers on horseback, rearing up and threatening and then being whisked away to a place of sanctuary. Images of cats recurred. Emeralds are found in South America (plundered by the conquistadors) and in Egypt (the cat goddess (Bast) guards the crossing of the river Styx to the other world and the cat goddess has emerald eyes). Suggesting that Emerald has influence over how we see things, this might be strongly held beliefs that get us into trouble or physical issues with vision. HEART CHAKRA Rx – encourages the person to verbalise underlying grief. Allows the person to speak the truth – sometimes people speak truth and don’t know it. Cases beyond redemption. They have been wounded. Heal all kinds of damage to Heart Centre cf NAT-M AUR – especially bad things coming from father/grandfather. Affects heart and throat. Abuse or suppression through patriarch. May have been used to hide the inadequacies of others. Too much ego or not enough – arrogant and haughty – gives humility or helps someone with lack of confidence. Fear they are not good enough and hide their own light – Helps self-acceptance – fulfill oneself. Helps lack of ideals – lost dreams. Indecision or jealousy, as well as warmth and love. People who misinterpret what is said to them (wounded ego). Heart disease now more common and not just down to diet, it is so important to try and clear the heart, then we can prescribe classically. Heart chakra is full of syphilis and vaccination. SYPHILLINUM works best combined with PLUTONIUM or AYAHUASCA. 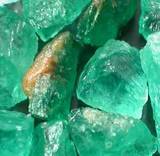 Or Emerald follows well after Ayahuasca, Oak and Sequoia. Rx is close to Goldfish (Carassius Auratus). Tachycardia, ectopic heartbeats and fibrillations. Pressure in chest. Cancers of those who never speak feelings. Can be more useful than Carcinosin in treating the pathology: esp. for cancer of the internal organs – can be given in 30c or higher once a week. Throat and genital cancer. so how did your provings go? Heart tonic Emerald 6x Kali mur 6x Crateagus 6x….please suggest if this is a combination and also how to administer I.e. TDs,BD, OD etc.